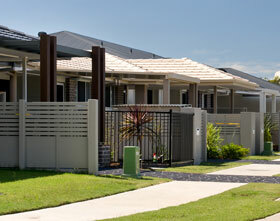 Ecolateral was engaged by Sekisui House Australia to model the performance of their premium SHAWOOD (c) Homes. This work included an analysis of the thermal characteristics and a comprehensive first principles report on the performance of their unique materials. Ecolateral also used the Economix Indicator tool on the homes to determine their overall energy use. Ecolateral carried out comprehensive training for the staff at Coolum on sustainable principles of the Built Environment. Ecolateral continues to work closely with the ULDA at Fitzgibbon in a number of capacities, including the delivery of the Economix Indicator to all homes in the 1600 lot development. This undertaking will have a substantial impact on the energy use of the residents and an understanding of how to control their energy usage and costs. Ecolateral provided the energy modelling and professional advice for the completion of a zero net energy home at Lot 16 Fitzgibbon Chase. 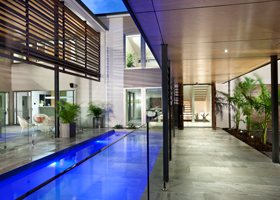 This home provides a model for the community on how to maximise energy saving by including a variety of low cost initiatives in a well designed home. Ecolateral worked with the design team to ensure compliance was achieved with the Energy Efficiency provisions in the Building Code of Australia in a practical and commercially effective manner. Ecolateral provides ongoing advice to the developers and architects on how to optimise their energy and water use, minimise their waste production and control heir carbon footprint. Kelvin Grove Design Guidelines Compliance. Ecolateral was engaged to assist and advise the design team in meeting the precincts comprehensive sustainability requirements. Compliance required Ecolateral to complete the building energy performance modelling required under the Building Code of Australia and confirmation that the buildings can meet a 4 star Green Star Multiresidential V1 level of performance if a rating is pursued. As a result of this stewardship the apartments will deliver superior thermal comfort level , a high degree of natural daylight, and a lower carbon footprint. Following the successful delivery of their KG8 apartment project, Jonbuild again engaged Ecolateral to provide sustainability advice and direction in delivering their Flourish apartments. 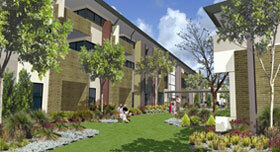 The result is an exemplary project featuring high levels of energy efficiency and water conservation. 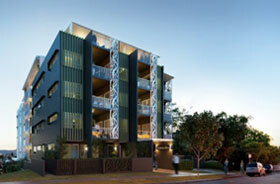 The KG8 Apartments are centrally located in the Kelvin Grove Urban Village. Ecolateral worked with the design team to advise, audit and certify compliance with the Kelvin Grove Urban Village guidelines and the Brisbane City Council Sustainability Code for Multi-Residential developments. 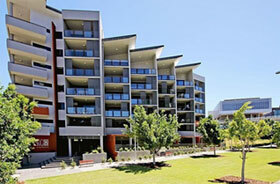 Vue Apartments is a landmark multi residential development facing the Brisbane River on Coronation Drive. 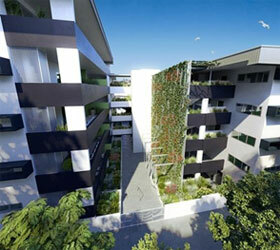 The apartment complex adopted an environmental strategy before the Building Code of Australia’s requirements were imposed. Responding to Brisbane City Council’s sustainability code, Vue delivered strong and practical sustainable elements on a busy and challenging site. Both the client and the architects worked with Ecolateral’s John Moynihan to deliver a powerful building, focusing on long life and loose fit. Client : Mr and Mrs Thomson. 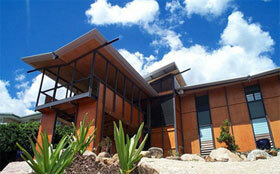 This project received the RAIA Sustainability Award Commendation and the RAIA Courier Mail People’s Choice Award. The design of the residence was strongly driven by the ESD Principles of maintaining and restoring biodiversity, minimizing the consumption of resources, minimising pollution of air, soil and water, maximising health and safety and building control, and increased awareness of environmental issues. Client : Mona Winery & Art Gallery. MONA is the latest museum attraction in Australia. 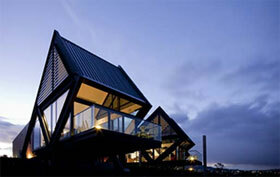 The project built on the shores of the Derwent River in Hobart, incorporates a series of whimsical holiday pavilions designed by Fender Katsalidis Architects. Ecolateral’s role was to provide energy rating services and advice regarding improving of the thermal performance of the buildings. The projects illustrates that good energy efficiency can be married with advanced structural design and architectural planning.